Being a food blogger, I get a ton of e-mails from my fellow bloggers that I read everyday. There are so many talented bloggers out there and when I came across this recipe from Smitten Kitchen, I knew I had to make it, but I re-vamped it a little to make it more healthy, less sugar, vegan and gluten-free. 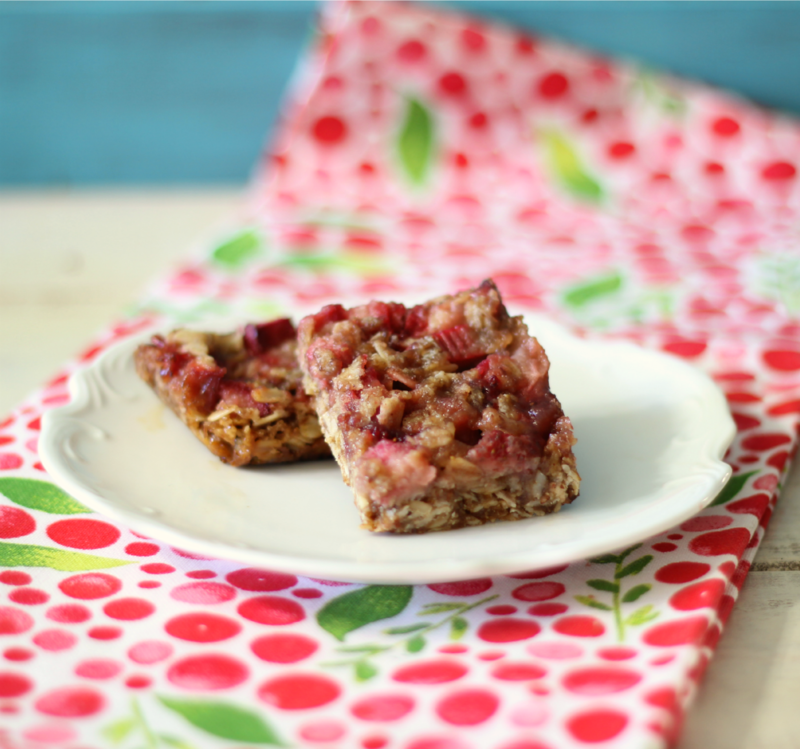 Today’s recipe is Strawberry Rhubarb Crisp Bars. These bars are amazing! 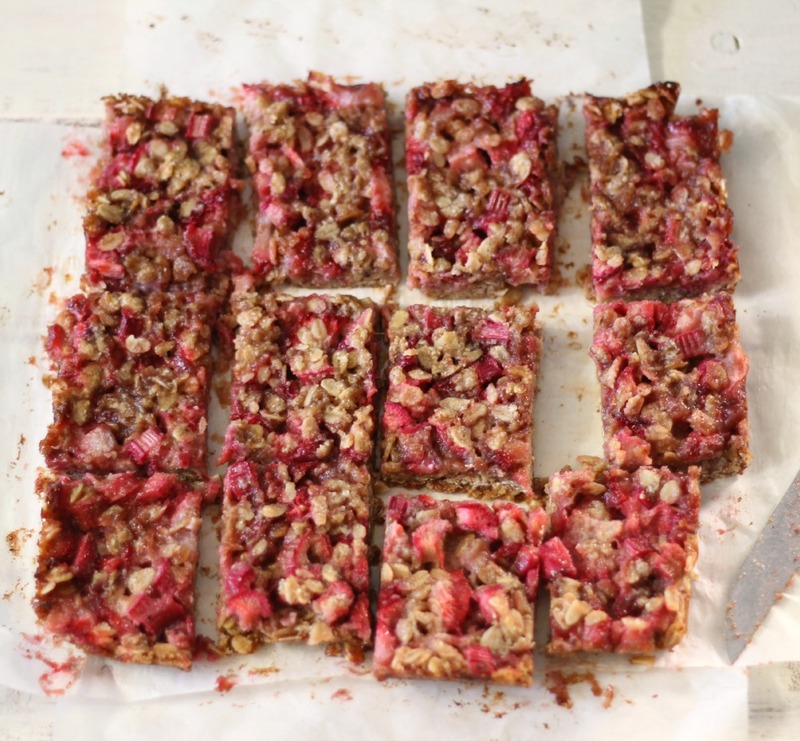 Sweet, loaded with fresh strawberries and rhubarb, soft and tastes like a crisp. I absolutely love these bars. The only thing with them, is that they are very soft bars, not crispy or crunchy. 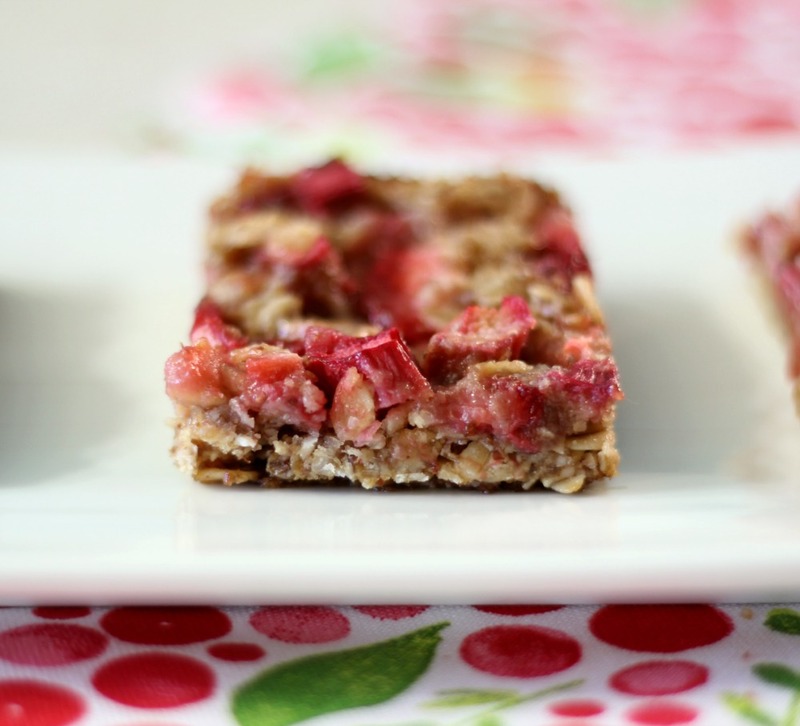 They make for a perfect, low-calorie snack or even great crumbled on yogurt. I love them and I hope you love them too! Line an 8 x 8 brownie pan with parchment paper for easy removal. In a large bowl, add rhubarb, strawberries, cornstarch, lemon juice,and sugar, mix until combined; set aside. In a small bowl add oats, almond meal, brown sugar, salt and baking soda; mix until combined. Pour melted coconut oil over the top; stir until combined. Reserve a half cup of mixture and press the rest of the crumb mixture evenly in the bottom of the pan. Spread fruit over the crust. Scatter reserved crumbs over the fruit. Bake the bars in the oven for 25 - 30 minutes, until fruit is bubbly and lightly golden in color. 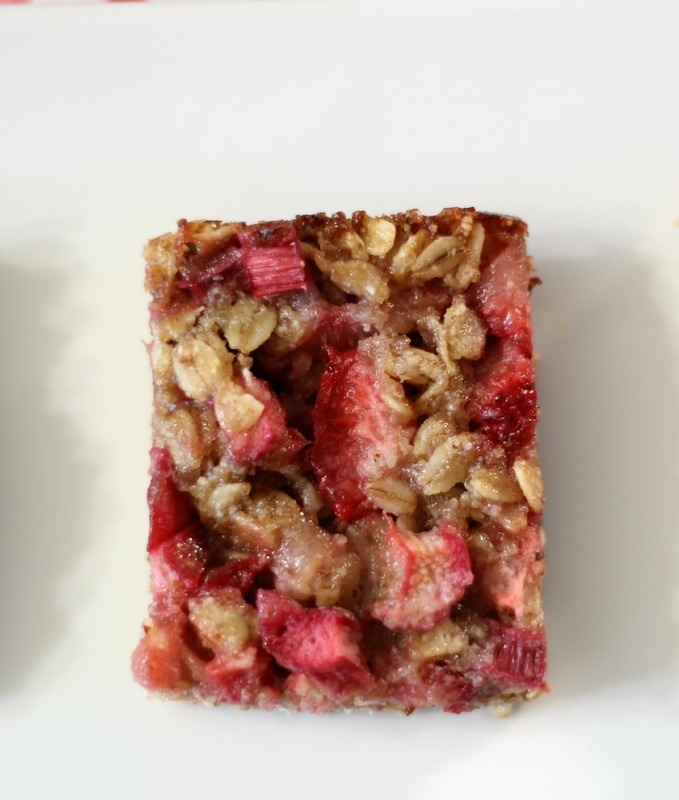 Let bars cool in pan and cut into squares. Sprinkle with powdered sugar, if desired. Store leftovers in fridge. 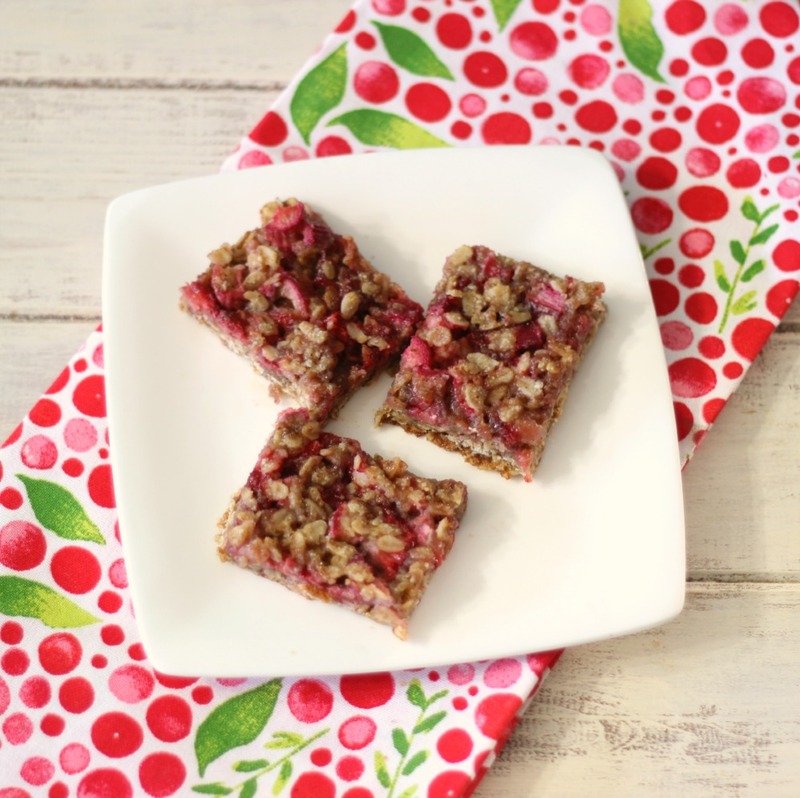 This is such a great snack and perfect for the kids after school. I bet they wouldn’t even know it is healthy! Plus if you’re at all inclined you could also add a small dollop of vanilla ice cream to go with it! That would taste amazing and be a perfect complement to the bars! I wish I had some left, because that is what I want to do right now! Sorry that the pictures didn’t turn out great! I took them at the wrong time of the day! So don’t let that fool you, these bars are amazing! Just remember to keep them chilled because they become very soft, especially if it is warm out! i love this!! so summery. 🙂 thanks for sharing! These bars look delicious but I can’t eat almonds. Any suggestions that I can use to replace the almond meal? Can you have cashews? If not try ground up more oats in pace of the almond meal. I am sure that would taste just as good! I am not sure I haven’t tried to freeze them, however I don’t see why not? I freeze just about all of my baked goods! Hi. I have a gluten sensitivity and find even gluten free oats not good for me. 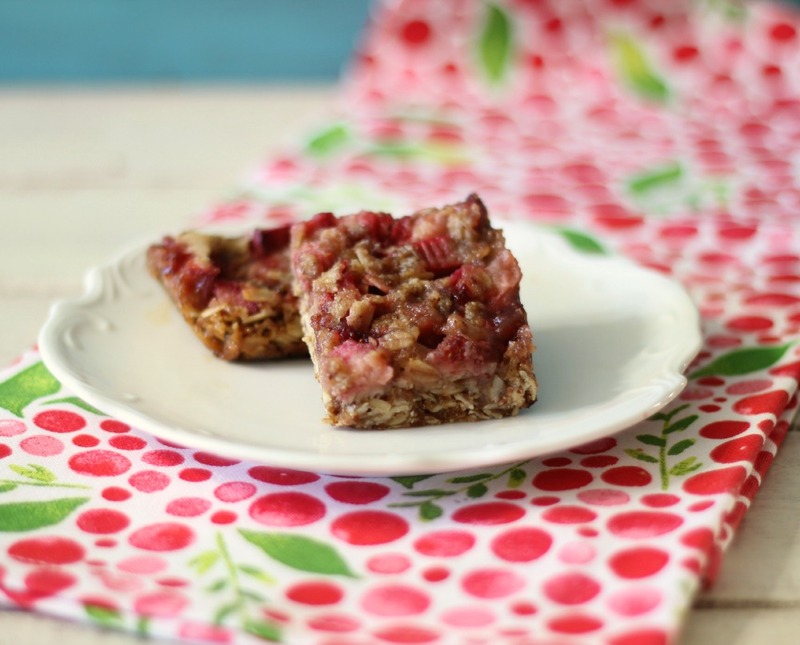 I love rhubarb crisp and will try this recipe. However, I will substitute quinoa flakes for the oats. Hello, if I don’t have almond meal, do you think ground flax seed could work in it’s place? Thank you! I don’t know, because flax seed is a different texture then almond meal. I would ground up oats and use that instead. You may want to do some research on baking with flax. From what I understand, it’s not meant to be heated. At best, you will be destroying the benefits of the flax and at worse, I’ve read that it can be harmful. I have made this twice. But without cornstarch bc I don’t have any. The taste is so good but it’s no where near a bar texture. It’s delish mush. Is that bc I am missing the cornstarch?